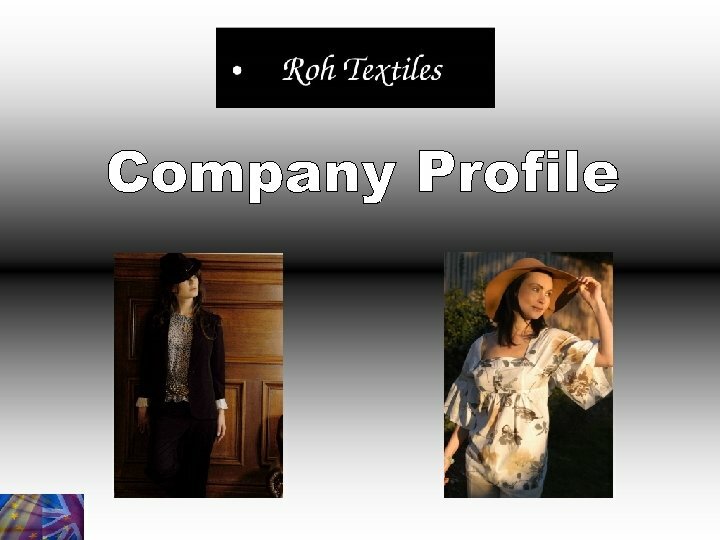 Roh Textiles is an established high fashion orientated company based in Romania. From sourcing the fashion, to designing the styles and manufacturing the finished garment, Roh Textiles are involved in the whole process. New styles and trends introduced every week to fit everyone's fashion needs. We are a high quality and professional service manufacturing garments, with high quality control and a sampling service. 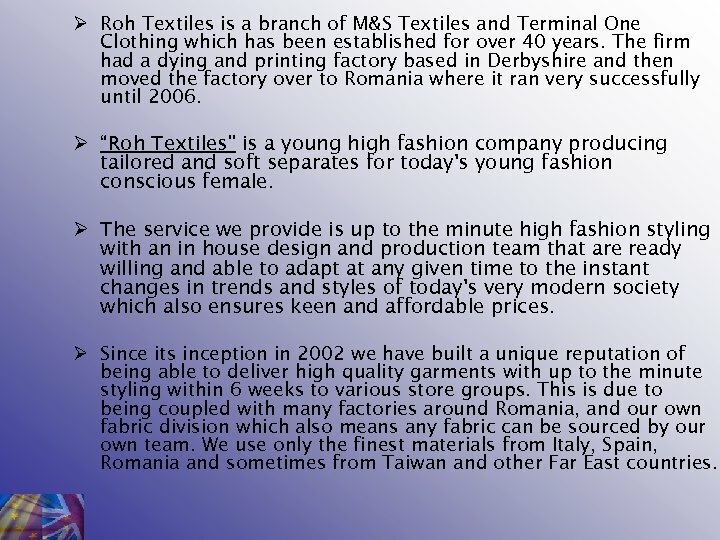 Ø Roh Textiles is a branch of M&S Textiles and Terminal One Clothing which has been established for over 40 years. The firm had a dying and printing factory based in Derbyshire and then moved the factory over to Romania where it ran very successfully until 2006. Ø “Roh Textiles" is a young high fashion company producing tailored and soft separates for today's young fashion conscious female. Ø The service we provide is up to the minute high fashion styling with an in house design and production team that are ready willing and able to adapt at any given time to the instant changes in trends and styles of today's very modern society which also ensures keen and affordable prices. Ø Since its inception in 2002 we have built a unique reputation of being able to deliver high quality garments with up to the minute styling within 6 weeks to various store groups. 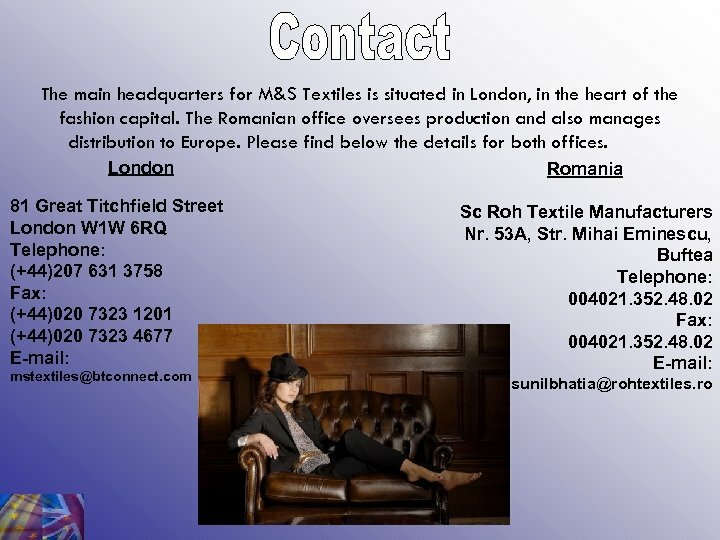 This is due to being coupled with many factories around Romania, and our own fabric division which also means any fabric can be sourced by our own team. We use only the finest materials from Italy, Spain, Romania and sometimes from Taiwan and other Far East countries. v Our department in Romania oversees and runs manufacturing & distribution and all of the crucial middle steps. Our factories are situated all over Romania and operate with the most up to date technology which affords us to cope with various high fashion high street changes. Our production capacity is approximately 10, 000 garments per week and can be comfortably increased according to demand. v Our quality control team, ensures that each garment is at its highest potential and has no defects. As a result of being a vertical operation this ensures we can offer keen prices which can only benefit all concerned. v Over the years we have worked with clients from a variety of countries including; Sweden, Germany, Austria, Switzerland, India and China. Brand names we have worked with include Jane Norman, Top Shop, Kurt Muller, Bay, Ethel Austin, AX Paris, Pilot, Vestry and Logo: to name a few just in the UK. 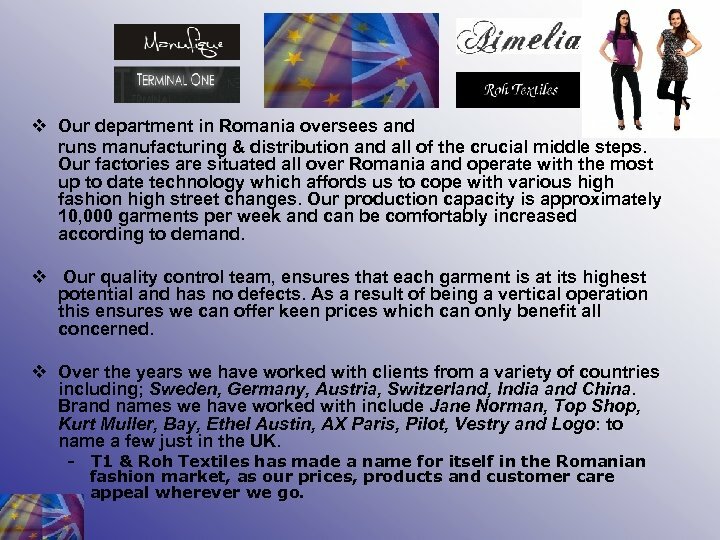 - T 1 & Roh Textiles has made a name for itself in the Romanian fashion market, as our prices, products and customer care appeal wherever we go. ü At the head office in the west-end of London there is a team including designers, technical directors and salesmen who all have sizable and valuable experience in the fashion world. ü We also have a distribution warehouse in Manchester and an office in Romania for overseeing all production throughout the country and quality control. 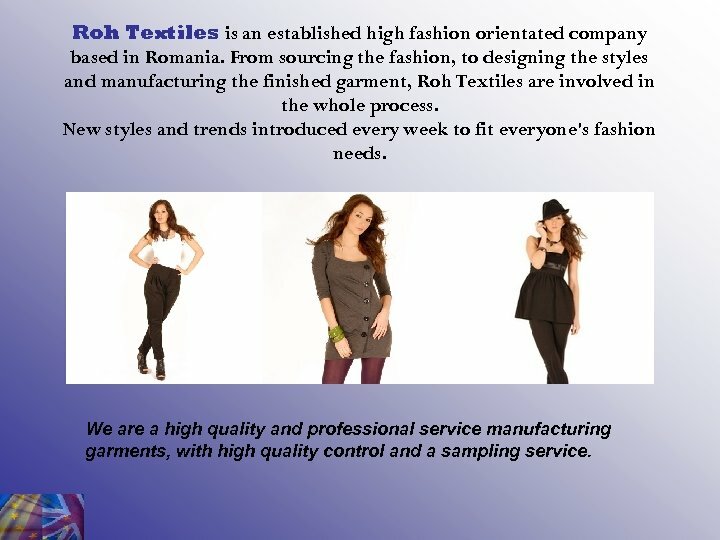 We have mass amounts of stock fabric and garments in our 10, 000 sq metres premises just outside Bucharest. There is office and warehouse land to rent or buy at our premises in Buftea, Ilfov. 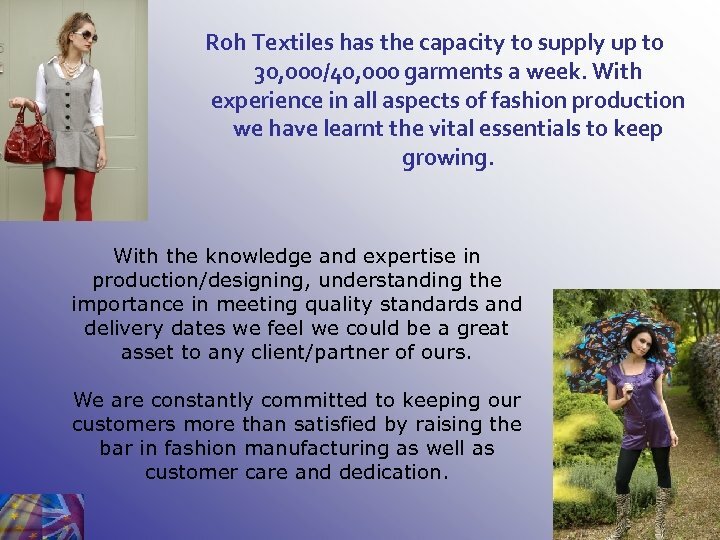 Roh Textiles has the capacity to supply up to 30, 000/40, 000 garments a week. With experience in all aspects of fashion production we have learnt the vital essentials to keep growing. With the knowledge and expertise in production/designing, understanding the importance in meeting quality standards and delivery dates we feel we could be a great asset to any client/partner of ours. We are constantly committed to keeping our customers more than satisfied by raising the bar in fashion manufacturing as well as customer care and dedication.